The Vikings’ longest-tenured player, defensive end Brian Robison, said he’ll continue to “stand up for that flag,” but he doesn’t have a problem with other players who protest. Video (02:01) : NFL owners voted to enact a new policy for 2018 that requires teams and personnel on the sideline to stand for the national anthem, but players and personnel now have the option to stay in the locker room if they don't want to stand. On Wednesday, NFL owners approved a new policy regarding the national anthem. Not much is expected to change with the Vikings, according to head coach Mike Zimmer. During owner’s meetings in Atlanta this week, owners voted to enact a new policy for 2018 that requires teams and personnel on the sideline to stand for the national anthem, but players and personnel now have the option to stay in the locker room if they don’t want to stand. Video (02:01): NFL owners voted to enact a new policy for 2018 that requires teams and personnel on the sideline to stand for the national anthem, but players and personnel now have the option to stay in the locker room if they don't want to stand. With the rule tweak, the NFL also put the onus on teams to create their own individual policies. The league will fine teams, not players, if a player doesn’t stand for the national anthem. A player could then be fined by his team. A handful of NFL players knelt or sat during the national anthem at points during the 2017 regular season, including the Raiders’ Marshawn Lynch, the Seahawks’ Michael Bennett and the 49ers’ Eric Reid. They carried on protest headlined in 2016 by Colin Kaepernick, who sat and then knelt during national anthems to protest police brutality and racial injustice in America. Most teams in the league, like the Vikings, didn’t have a player sit or kneel during the anthem in the regular season last year. 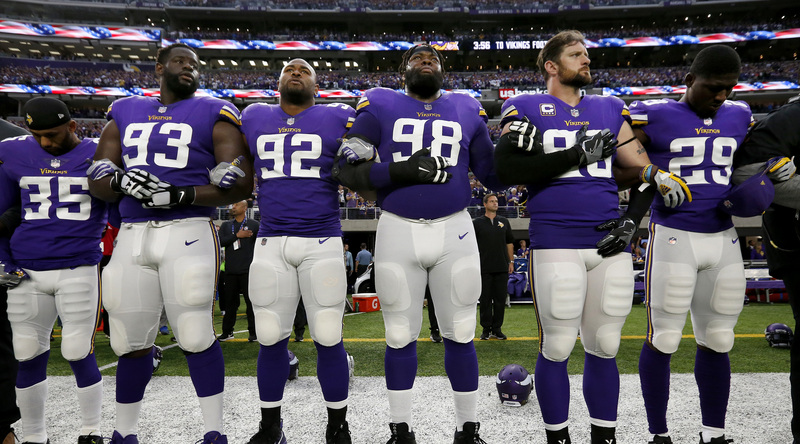 In September, following President Donald Trump’s comments criticizing anthem protesters in the NFL, the Vikings (and several teams) took on variations of standing for the anthem without kneeling or sitting. Vikings owners Zygi and Mark Wilf, along with general manager Rick Spielman, interlocked arms along the sideline with the majority of players prior to the Week 3 win vs. Tampa Bay. Receiver Stefon Diggs declined to discuss the NFL’s new policy allowing players to stay in the locker room for the national anthem, other than saying he doesn’t want to draw attention to himself. Poll: Do you agree with the NFL's new national anthem rule?